I went looking for a recipe and found one on Food Network's site from Paula Deen. No butter here though, it's a good, solid basic pizza crust recipe. I'm not against her use of butter though since I only use butter (instead of margarine or shortening). It's a rare day when you see me use shortening but you won't ever see me use margarine. This recipe calls for bread flour and you should use it because it gives the bread a little more chew which is awesome with pizza crust. We topped ours with some sauteed mushrooms and some leftover fig and onion bruschetta topping we had made. 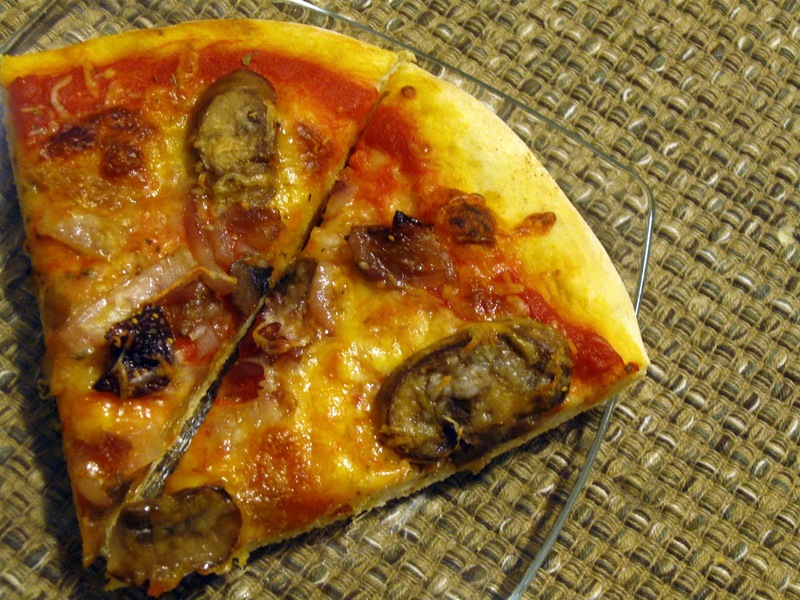 I was a bit apprehensive about the fig and onion topping but it was delicious on pizza! Please note we didn't put the ricotta mixture on the pizza, we ate all of that with the bruschetta we made :). Although I'm sure the ricotta mixture would have been delicious also. Pizza is so versatile that it makes it more fun to make at home and customize it with crazy toppings. This recipe says it makes two crust but I split it into three and it's feeds 2 1/2 quite well for dinner with a salad or other side. Happy baking! 1. Preheat oven at 450 degrees F.
2. Measure out 1 3/4 cups warm water (it should be pleasantly warm on your wrist). Sprinkle the yeast on top of the water and allow it to activate, about 10 minutes. 3. Put the salt and 2 cups of the flour into a food processor. Pulse 5 times to blend. Pour in the yeast and water and pulse 5 times. Add the olive oil. Add the remaining flour 1 cup at a time, pulsing and scraping the sides of the bowl until well blended. As soon as the mixture is combined, dump it out onto a well-floured board and knead for 15 turns, until the dough is smooth and elastic. 4. Place the dough in a greased bowl and turn to coat all sides. Cover with plastic wrap or a tea towel. Allow the dough to rise in a warm place for about 45 minutes, until doubled in size, then punch it down. Divide it in half; each half will make 1 (12-inch) pizza. 5. Place on a cornmeal-dusted pizza stone, pizza pan, or cookie sheet. Roll up edge slightly to create a ridge around the pizza. Bake for 16 to 18 minutes, or until crust is light brown. Cook's Note: If using only half dough, freeze the other half. Place the dough in a resealable freezer bag. To thaw, remove the bag from the freezer and place in the refrigerator for 24 hours. Roll the dough out while cold then allow it to come to room temperature before adding toppings.